HOW TO EAT IN TOKYO, JAPAN — potato chips are not dinner. I was a late adapter to chopsticks. I wasn’t able to properly use them with any sort of efficiency until I was well into my twenties, so dining in Japan intimidated and terrified me because I've yet to become very good at it. Still, there was no way I was going to be That Person asking the waiter for a fork because I had poor chopstick dexterity. I’m pretty sure eating ramen with a fork in a Japanese restaurant is a punishable offense anyway, or at least it should be. Though I did a lot of googling in regards to etiquette before my trip to Tokyo (which I always try to do before traveling to a new country), I still managed to look like a barbaric American at times. So in hindsight, here are some things I could have done differently! I’m passing on my embarrassments to you so you don’t have to live through them too. Though a seemingly easy mistake to make, this is a huge faux pas, because it is symbolic of death and funerals. I did this because I realized I wanted to reshoot some photos of what I was eating and quickly stuck my chopsticks in my rice so I could get my camera back out. Then the intense side eye I received from the guy sitting next to me as I did this reminded me of my mistake and I quickly took them out. It was too late though, the damage had been done, and shame really affects the taste of things, let me tell you. If you need to set your chopsticks down, you can use a chopstick rest, or if you weren’t given one, place them sideways across your bowl. On a related note, try to keep the food styling and other weird food blogger things to a minimum (don’t you dare stand on that chair!) as it is also considered rude to multitask while eating. It makes that slippery piece of tuna so much easier to eat, I know. But just don’t do it, it’s considered extremely tacky. It’s hard because Onigiri and Yakitori seem like they were made specifically to be eaten on the go, but snacking on trains, on the street, or while walking is not acceptable. This seemed very restrictive to me at first, but as soon as I saw how impeccably clean and organized Tokyo is, despite it’s extreme over-the-top-sensory-overload insanity , it all made sense. These rules HAVE to be in place simply because there are so. many. people. 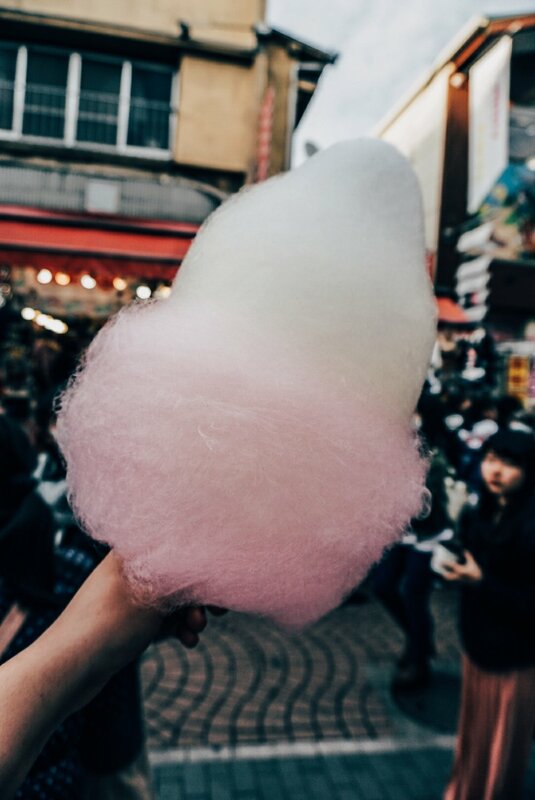 The only exception was when I stopped at Totti Candy Factoryin Harajuku, famous for it’s larger-than-your-head clouds of cotton candy, and they corralled us into a little space of the crowded street where we were allowed to stand and eat our cotton candy. Someone left their cotton candy stick on the ground, and it took approximately .5 seconds for a cleaner (who had been watching us all like hawks) to sweep it up from the ground. There are several more, but as long as you act with a modicum of decency and do your best to avoid the big ones such as #2, and correct yourself immediately, you will be fine. I had a very long list of places and things I wanted to eat while in Tokyo, and a Kaiseki meal at YAKUMO SARYO was at the very top of that list. Yakumo Saryo is a gorgeous restaurant tucked into a quiet neighborhood just outside the main hustle of Tokyo, in a stunningly minimalist house with tables that overlook a peaceful garden. Kaiseki is a multi-course Japanese meal made with only the finest of seasonal ingredients and meticulous attention to detail. The courses usually consist of an appetizer, sashimi, a simmered dish, a steamed course, a grilled course, and any other dishes that the fresh ingredients have sparked inspiration in the Chef that day. Be sure to make reservations if you want to dine at Yakumo Saryo. Before we started our meal we were given a tour of the house and sipped on refreshing sparkling green tea. After our Kaiseki meal, we were brought into the tea ceremony room for Matcha and traditional Japanese sweets. In addition to the Matcha, during the ceremony we also sipped on roasted green tea which had a lovely and subtle smoky flavor. TSUKIJI FISH MARKET is a wholesale market that sells many kinds of fish, seafood, vegetables, and ceramics, and people come from all over the world to witness the Tuna auction, eat Sushi for breakfast, and try novelty fruits such as white strawberries. Google translate was a life saver in many ways during the trip, but it was also hilariously wrong much of the time. For example, it translated the sign for the sea cucumbers in the photo above (the red tubular creatures in the bottom right container)as "e54 what". Any pickled vegetable you could possibly imagine. Never had sushi for breakfast? Tsukiji is the place to do it. As I was walking around the market, I noticed a line forming, in the rain, an hour before SUSHI KUNI opened. So of course, I got in it. Every drop of rain my poor head absorbed was worth it. I had the most buttery and smooth Uni , the Tuna was unbelievably fresh and melted in my mouth, and underneath all of that goodness was warm and perfect sushi rice. Sushi Kuni serves Sushi, of course, but their Uni bowls are what people wait in line for. The strawberries on the right might look like they are under-ripe, but they are white strawberries, also sometimes called pineapple strawberries, and they taste like candy! Pillowy white mochi, filled with bean paste and wrapped around the strawberry, or Daifuku, is a treat you cannot pass up while wandering the Tsukiji food stands. I'm pretty surprised that my pants still fit after this trip because on one of my days there I ate lunch and dinner at the same Ramen place. My two favorite spots in Tokyo were very different- one was intense, garlicky, and full of pork flavor. The other, light and citrusy with a yuzu citrus-spiked broth. All of the Ramen spots I went to had vending machines at the entrance, which I thought was truly genius since there usually wasn't much seating available in each restaurant and this eliminated the time wasting aspect of getting seated, waiting for your order to be taken, etc. I'd select the kind of Ramen I wanted just like any other vending machine, then added any extras such as nori or extra garlic or chili paste or beer, pay, and the machine would spit out tiny little tickets which I would hand to a server. AFURI is a trendy Ramen spot with a few locations scattered throughout Tokyo, and completely worth the hype and long lines because of it's unique and tangy yuzu broth made with water from Mt. Afuri. ICHIRAN is also a chain, and I am not ashamed. It was my favorite ramen in all of Tokyo. Maybe partially due to the little private booths, where I felt free to slurp the noodles with violent, wild abandon? 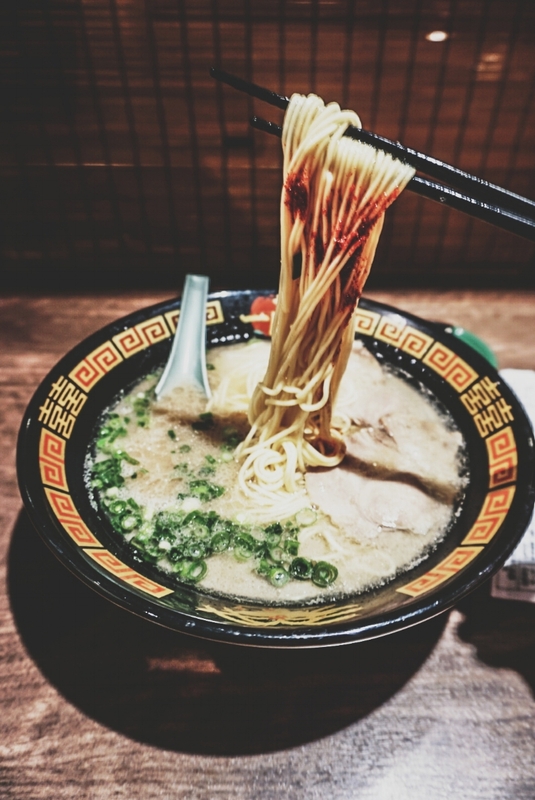 I tend to gravitate towards salty, and more pork-heavy ramen broths so if you do too, you won't be disappointed. The best view of all of Tokyo is definitely at the top of the TOKYO TOWER. (the very first photos of the city in this post are from there) I didn't care how many people I had to be wedged into an elevator with, or how cliche it was- the view was truly amazing. Your suffering will be rewarded with a food court the size of your average US shopping mall that boasts every kind of sweet shop you can imagine. I'm talking entire cafes dedicated to cheesecakes and matcha desserts, and approximately five million chocolate shops. Inside the food mall there is GION TSUJIRI which was a dream come true for a matcha obsessed person like me with their matcha soft serve, matcha floats, matcha lattes, matcha everything. I had matcha soft serve drizzled with matcha condensed milk and it was packed with tea flavor while still delicate and creamy at the same time. Takeshita street in Harajuku is loony, neon, loud, overcrowded, and completely overwhelming. In between the hundreds of people walking the streets, I spotted gigantic rainbow-colored clouds of cotton candy bobbing around and headed to TOTTI CANDY FACTORY to try the cotton colorful cotton candy for myself. AND LAST BUT NOT LEAST...TOKYO BANANA CAKES! Grabbing a few boxes of Tokyo Banana cakes at the airport as you're heading back home is an absolute must. People risk missing their flight standing in line for these. Out of all the flavors in this world, I really hate fake banana flavor but these fluffy chiffon cakes are filled with fresh banana puree, and you can't get them anywhere other than Japan, so buy a hundred boxes.